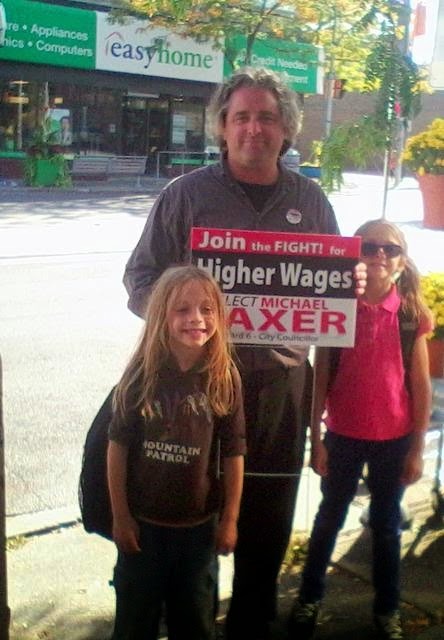 "Michael Laxer, a self-described socialist candidate running in Etobiocke’s Ward 6, is also disturbed that voters, especially those inclined to support Olivia Chow, now plan to vote for John Tory because recent polls place him as the frontrunner. “John Tory has become the strategic, all embodying alternative to Doug and Rob Ford(open Rob Ford's policard). He’s seen as the person you have to vote for if your apparent objective is to stop the Fords and their agenda,” Laxer said. "Voting for John Tory means enabling the very worst logic of "strategic voting". The liberal "left" has brought this on itself by its embrace of the logic of getting "better" people elected "strategically", and the sheer anti-democratic stupidity of the idea is now being proven. The false, dangerous and profoundly self-defeating idea that voters should be "realistic" and embrace the "best" alternative to the worst option is coming back to haunt the many among the Liberals and New Democrats who have so often and so misguidedly advocated for it in different circumstances when it seemed to their benefit. It is an idea that has empowered the right and facilitated the left's defeat. Now that "strategic voting" is being used to advocate John Tory's election, one hopes that the cynical notion itself will be abandoned. Realism in the electoral arena is a game the left simply cannot win, as Chow's campaign has again shown. There will always be a more "realistic" option. Perhaps it is time to once and for all abandon the right wing farce of "realism" and start to actually advocate openly and avowedly for the principles we allegedly believe in." Strategic voting...it is ALWAYS a mistake! Video from the Fare Free Transit Forum held jointly by my campaign and the Greater Toronto Workers' Assembly on September 28 is now available online. Both videos can be found on the Socialist Project website: http://www.socialistproject.ca/leftstreamed/ls234.php and are embed directly below. Is fare free transit possible in Toronto? What would be the social benefits of such a transit policy? How would free transit benefit the suburbs and Etobicoke? What can we learn from the free transit experiment in Tallinn, Estonia?" Get your sign October 2nd & Join the Fight! The signs have arrived! You can have one in your window or on your lawn October 2nd and show your support for a real alternative to cutbacks and austerity. Each sign has a message and you can pick yours: Higher Wages, Free Transit or Public Services! 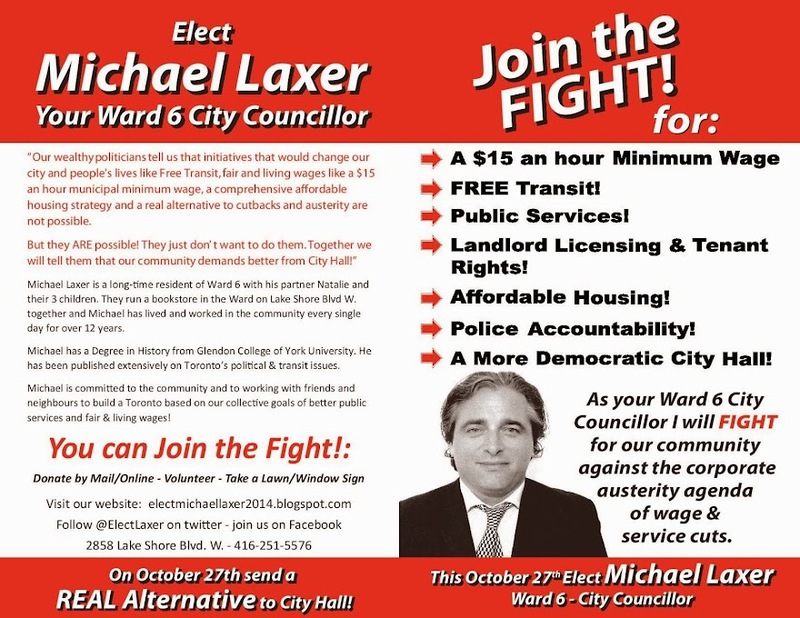 Email us at electmichaellaxer@outlook.com or call 416-251-5576. Two Exciting Upcoming Campaign Events in September! Where: The Big Guy's Little Coffee Shop, 2861 Lake Shore Blvd. W.
When: Sunday, September 28, 2:30 p.m.
Join us in heart of South Etobicoke for a public discussion forum about the fight for Free Transit in Toronto. Kamilla Petrick of the Greater Toronto Workers' Assembly's Free and Accessible Transit Campaign & Ward 6 Socialist City Council candidate Michael Laxer, who is campaigning for Free Transit, will be speaking and moderating the discussion. Kamilla Petrick is an activist and academic living in Toronto and has contributed to the growing Toronto public transit movement as a member of TTCRiders and the Free Transit campaign. -Is fare free transit possible in Toronto? -What would be the social benefits of such a transit policy? -How would free transit benefit the suburbs and Etobicoke? -What can we learn from the free transit experiment in Tallinn, Estonia? The event is free to attend and everyone is welcome. Some refreshments will be available for free and coffee/tea and other refreshments will be available for a charge from the coffee shop. The Big Guy's Little Coffee Shop is a fully accessible venue. Canvass for a Socialist Candidate! Where: Campaign Office, 2858 Lake Shore Blvd. W., Etobicoke. When: Sunday, September 14, 11 a.m. Earlier this year, Seattle elected socialist Kshama Sawant to council and she spearheaded a campaign to introduce a $15 minimum wage to the city. We'll be heading out for about 2 hours of canvassing - you can either choose to just drop off pamphlets or if you're the talkative type, do some doorknocking. The campaign office address is at 2858 Lake Shore Blvd. W. (at 5th St.). It is on the 501 Queen Streetcar line and there is a 5th st. stop). It is two blocks east of Islaington for those who take the subway (they would take the subway to Islington & the 110 Islington South bus to Lake Shore & walk east). Afterwards, if you want to join us, we will be heading down to the Parkdale March to Freeze the Rent! Toronto Needs to Take Action on Poverty! After gradually declining to 27 per cent in 2010 from a high of 32 per cent in 2004, the city’s child poverty rate has increased once again. In some areas it’s much worse: 15 of Toronto’s 140 neighbourhoods have child poverty rates of 40 per cent or more, while 40 have poverty rates of 30 per cent or more. In fact, among Canada’s 13 major cities, Toronto tied with Saint John, N.B., as having the highest poverty rate, according to the analysis of new Statistics Canada data by a coalition of social agencies. A municipal living minimum wage, a serious affordable housing strategy and landlord licensing, fighting for fare free transit and to eliminate user fees; these are just a few of the initiatives Toronto needs to really do something to change this unacceptable situation. What Toronto does not need is more platitudes, studies and committees! It needs action. 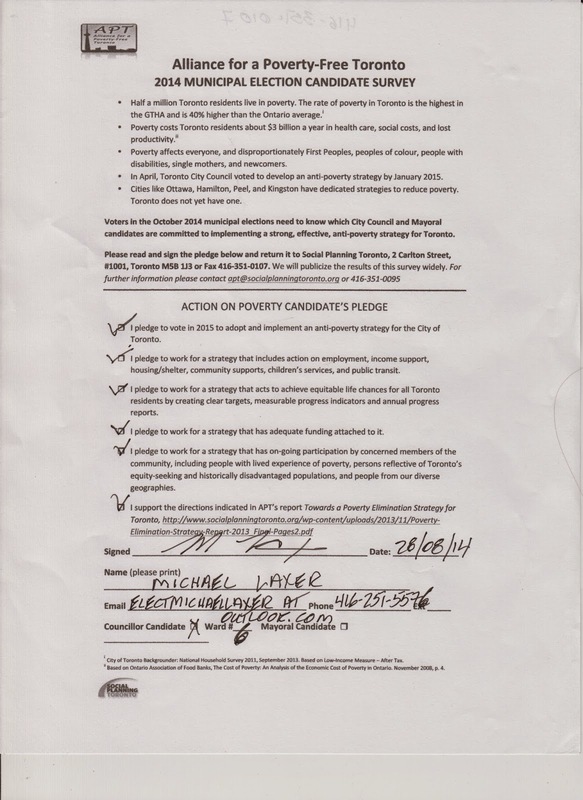 As part of my campaign for real change and action at City Hall, on August 28, 2014 I signed the "Action on Poverty Candidate's Pledge" of the Alliance for a Poverty-Free Toronto. Together, we can end poverty in our communities and neighbourhoods!